The proliferation of extremely intense synchrotron sources has enabled ever higher-resolution structures to be obtained using data collected from smaller and often more imperfect biological crystals (Helliwell, 1984). Synchrotron beamlines now exist that are capable of measuring data from single crystals that are just a few micrometres in size. This provides renewed motivation to study and understand the radiation damage behaviour of small protein crystals. 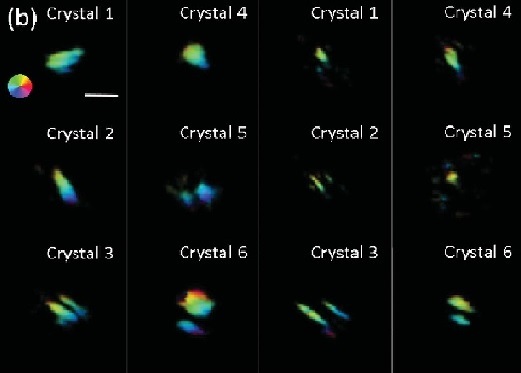 Reciprocal-space mapping and Bragg coherent diffractive imaging experiments have been performed on cryo-cooled microcrystals of hen egg-white lysozyme as they undergo radiation damage. Several well established metrics, such as intensity-loss and lattice expansion, are applied to the diffraction data and the results are compared with several new metrics that can be extracted from the coherent imaging experiments. Individually some of these metrics are inconclusive. However, combining metrics, the results suggest that radiation damage behaviour in protein micro-crystals differs from that of larger protein crystals and may allow them to continue to diffract for longer. A possible mechanism to account for these observations is proposed.